History: Earth-238, sometimes known as the Crooked World, was (according the King Arthur) the most retrograde of the linked Earthworlds. This estimation was echoed by Saturnyne, Omniversal Majestrix, who was leading a small squad of men, the Avant Guard, on behalf of the Dimensional Development Court in order to give it an evolutionary push before its backwardness retarded the progress of all the other Earths. Unknown to these well-intentioned interlopers, the cause of this problem was an immensely powerful mutant, Mad Jim Jaspers, who could warp reality with his mind. Even without trying, his insanity was leaking over into the general populace, making them more aggressive and reactionary than they would otherwise be. 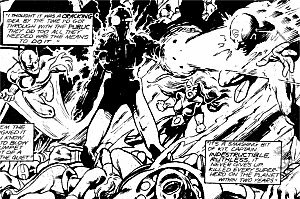 He had masterminded the extermination of all the other superhumans on his world using the Status Crew and a killer cybiote called the Fury, leaving him unchallenged to do as he wished. The Fury was an unstoppable killing machine that never gave up, and it had hunted down every superhero on its world, until it cornered the last few huddled together in a desperate attempt to stave off extinction. Within two years it had eliminated every hero on the planet. Only one, Captain U.K., had managed to survive this purge by escaping to another dimension. Into this mix came the Captain Britain of Earth-616, along with his companion Jackdaw, an elf from Otherworld. 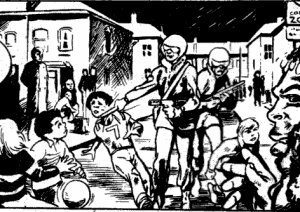 They had been sent to this reality by Merlyn, supposedly to help this Earth develop, but in reality as part of Captain Britain's training before he would be forced to face the even more powerful version of Mad Jim Jaspers that resided on his own Earth. 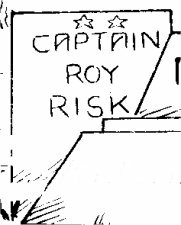 Initially confused by the fascist state of Britain he had landed in, the good Captain soon discovered Saturnyne's plot and after some discussion, joined forces with her. With each other's assistance, it didn't take long for Britain to be exposed to "the Push" up the evolutionary ladder it needed. But even as the heroes celebrated their success, Mad Jim Jaspers unleashed his full powers and turned his entire reality into a twisted nightmare where no physical law could be certain to hold force. In the midst of this chaos, the Status Crew struck against the other-dimensional interlopers, unleashing the Fury. It made short work of Saturnyne's assistant Dimples and Captain Britain's sidekick Jackdaw, and would have killed the Captain too, if Jaspers had not intervened, granting him a brief reprise. Jaspers explained that he was the force behind the world going insane, and then dropped the shattered hero in the middle of the superhero graveyard, where the Fury finally killed him beside the empty grave of Captain U.K. Its work done, the Fury stopped to think. Shortly thereafter Saturnyne was put on trial for her failure to carry out a successful Push on Earth-238. The Judge at her trial, Lord Mandragon, ordered and then carried out the destruction of the entire 238 Continuum in order to stop the spread of the Jaspers Warp to other universes around it. Comments: Created by David Thorpe and Alan Davis. Destroyed by Alan Moore and Alan Davis. The entire Crooked World saga started as a bit of a mish-mash. 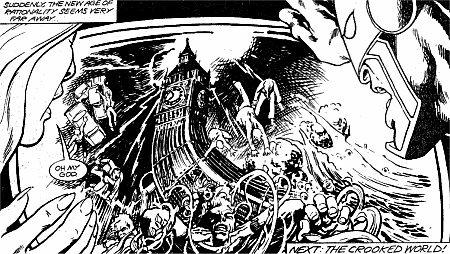 It's unclear what David Thorpe had planned in the long run for the fascistic Earth-238, but when Alan Moore came in he proceeded to demolish everything that had come before (his lead character included) in the space of 11 pages (2 five page episodes, and the last page of the episode that had come before them). Not content with turning that entire Earth into a madhouse with no set physical laws, he then blew it all up a few issues later. When Moore needed a bunch of Earth-238 superheroes for the Fury to slaughter, he liberally borrowed them from old British superhero strips. Ironically, one of the characters he used was the 1950's superhero Marvelman, whom he would later revive properly in the British Warrior magazine. 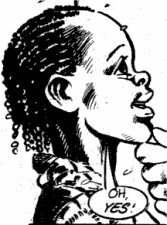 In the Crooked World, Marvelman's counterpart was called Miracleman, which ironically would be the name that Marvelman would be sold under in the States a few years later, following threats of legal action from Marvel Comics. Alternate 666 or Alternate 257 in Grant Morrison's Zenith strip in 2000 A.D., both of which are also world's containing disguised versions of old British superheroes. Earth 3, the DC World populated by villainous versions of the Justice League of America, which is a world of crooks, rather than a crooked world. 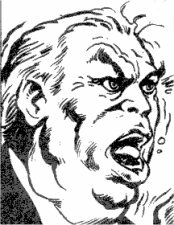 Home Secretary Wilcox-Smyth (Marvel Superheroes#381) - Wilcox-Smyth was the Home Secretary of Britain in the Crooked World, responsible for maintaining law and order. When he heard that a costumed hero was gallivanting around the country, after they were all meant to have been banned in the sixties, he swiftly lost his temper and ordered the Status Crew sent in. (Marvel Superheroes#384) Captain Britain imagined Wilcox-Smyth as being the insane puppetmaster behind the outrages of Crooked World Britain. (Which is weird, as the two were never seen to meet). Autumn (Marvel Superheroes#383) - Autumn was a seven year old girl whose father was out of work. She asked Brian Braddock to give her a quid (one pound sterling). With no native currency he was unable to oblige, but offered to show her some magic. When she agreed he took her flying, and she told him that "Sometimes I think this must be the worst world anywhere." Her innocent questions were what finally provoked Captain Britain into helping Saturnyne with her efforts in the Push. (Marvel Superheroes#388) - Onboard Mad Jim Jaspers flying teacup, Captain Britain was confronted by Autumn, only this time her head was surrounded by a wreath of fire. Whether this was the real Autumn or an image conjured up to torment him was never established, as reality was hard to determine by this point. This was the last straw for the hero, who ran away, and fell out of the teacup into the heroes' graveyard. (Marvel Superheroes#386) - Jeff was returned home, but Captain Britain needed the aid of Jackdaw and the evolutionary enhancing fluid to prevent a dangerous gang war between the two areas.